Film Duration : 1 hour 10 mins. 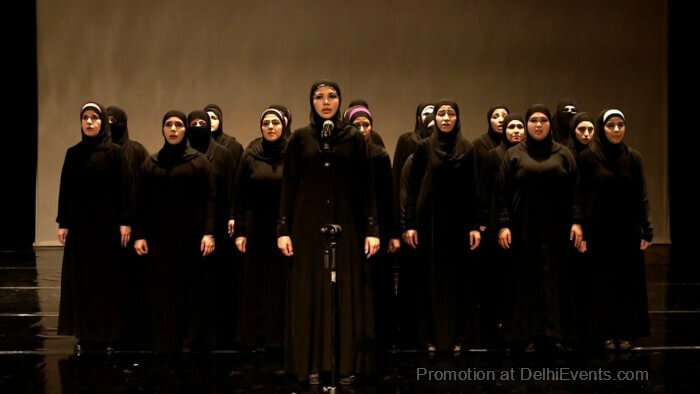 documentary drama that depicts the life and struggles of Syrian women forced into exile after the Syrian crises. It is the story of fifty women who came together in 2013 and created their own version of ‘The Trojan Women’, the classic Greek tragedy about the plight of women during the Trojan War. British Council seeks to connect people through the arts, and Queens of Syria is fascinating precisely because it documents the connection that modern day women find to a play written centuries ago, about the fate of queens and princesses who suffer loss of family and country. British Council is pleased to make this extraordinary story available to Delhi-ites, and hopes to excite and inspire viewers. Apart from the enacted play, it is also inspiring to watch the actresses tackling regressive gender norms and attitudes about women performing on stage. Each of the women feared some form of retaliation or push-back from conservative families, but valiantly went on to perform, in order to make their voices and stories heard. Award winning documentary filmmaker and BAFTA nominee, Yasmin Fedda has directed this incredible documentary. Queens of Syria won the ‘Best Director’ from The Arab World award at the Abu Dhabi Film Festival in October 2014 and has since screened at the Glasgow Film Festival, Dublin Film Festival and others.